Evaluating cards is tough. Writing about evaluating cards is also tough. I've rewritten this article a million times. Originally it was based around examples but then the comparisons became too harsh against a particular card and let's be honest with ourselves here, you don't come to me for that.Then I attempted to write this about the current Standard but decided against it because even though it had some great examples, Standard is a thing defined by time and those examples would be given a lifespan rather than being timeless. Another thing we should be honest about, you don't come to me wondering about my process for writing these articles so let's just stop right there and get on with how you can evaluate cards for MTG like a majestic manatee. Trust me, that example will make perfect sense by the end of this. Disclaimer: This isn't the only method of evaluating a card and I'm probably even forgetting certain factors because I internalize all of this instantly when looking at a card rather than in steps soooooo please forgive me if I've left anything out. Always check the CMC of a card first. See if the card sings to you. Is what you're getting worth the amount of mana you're paying? Is it above the curve or below the curve? That's fancy talk for comparing a spell to the average effect or power/toughness you should expect from it. Not sure if it's on, below, or above the curve? Go to step 2. Look at what color it is. If it's Green then you should expect the power/toughness to be higher than the average creature for its CMC. You have to understand the general color pie to be able to pull this off but it's not very difficult. Just learn what each color is known for or what it cares about the most. For example, Black is known for discard effects, creature destruction, graveyard manipulation, and draining life among other things (the list is pretty extensive for each color) and it cares about ambition, death, and darkness (and playing in a rock band on the weekends). Keywords and abilities work this way as well. Flying is an ability Blue has mastery over while First Strike would be more commonly seen in White. Each color has primary and tertiary traits. For example, Flying is tertiary in White. If everything I'm saying is gibberish then you need to learn about the Color Pie first before you attempt any of this (head over to the official MTG website and read). Not sure how it stacks up in its color? Go to step 3. Take the spell you're looking at and compare it to a similar spell/effect/creature/sea cow/whatever. Is it a Red direct damage spell (burn spell)? Then compare it to whatever basic burn spells are in the current Core Set. As of the time of this writing, M13 is the current Core Set. Lightning Bolt is no longer the standard for burn spells (they're much weaker right now). That's because the color pie is constantly fluctuating for what should be the standard. Cancel is still the standard for a hard counterspell in Blue. Knight of Glory is the current standard for a White 2CMC creature. Not sure about the card's usefulness? Go to step 4. Rarely is a card completely useless. Even if a card looks sub-par, it's usually more effective in a different format. Most cards in a set are designed for Standard Limited, some cards are designed for the multiplayer formats, some Legends are designed strictly for EDH (Commander), some cards are designed to fix a problem in a particular format, and the list just keeps going. Even if you think a card is bad in Standard, it might be amazing in Limited or another format. Not sure how amazing it is for a given format? Go to step 5. The biggest mistake I see made about card evaluation is this right here. Too many players compare a card inside of a vacuum where it's untouched by other cards/decks/strategies. Cards aren't played that way. When you play a card, your opponent will interact with it in some way. 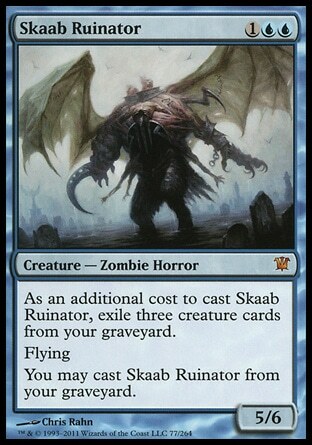 For example, many thought that Skaab Ruinator looked like one of the greatest creatures of all time (inside of a vacuum). For this very reason he was initially very expensive to buy as a single. The reality of course is that he isn't as effective as anyone thought. His additional casting cost of exiling three creatures from the graveyard meant he wasn't actually 3CMC. He's closer to virtually being 6CMC with a drawback. What if they just return him to your hand or destroy him as soon as he comes into play? Sure, you can cast him from your graveyard but you're going to need another three creatures to exile. Once people realized this, his price plummeted. Initially he cost over $20 for a single copy and now you can get him for less than a $1 (and he's still in Standard when prices are typically at their highest). The hardest part about this step is there are so many factors to take into account. Just start by thinking about the most common things that could hurt the card or the most common tactics someone might use against it and then decide from there. I hope this info helped and that the manatee metaphor makes perfect sense now. It's obviously so clear that I don't even need to explain it. This is Kylak signing out and hoping that you will float like a sea cow.